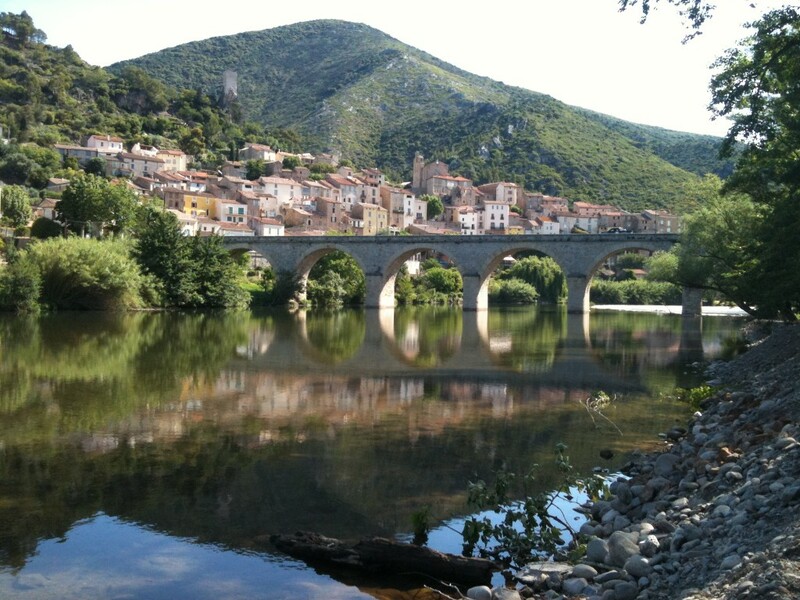 Roquebrun is a small town of cream houses and red-tiled roofs nestled above the Orb river. It claims to be one of the prettiest towns in France, and it is certainly lovely, but that wasn’t what brought us there today. 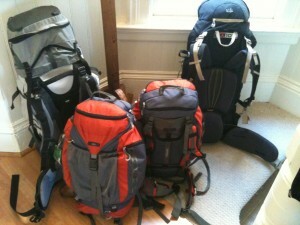 We drove there, along tiny winding roads, to rent canoes for a trip down the Orb river gorge. 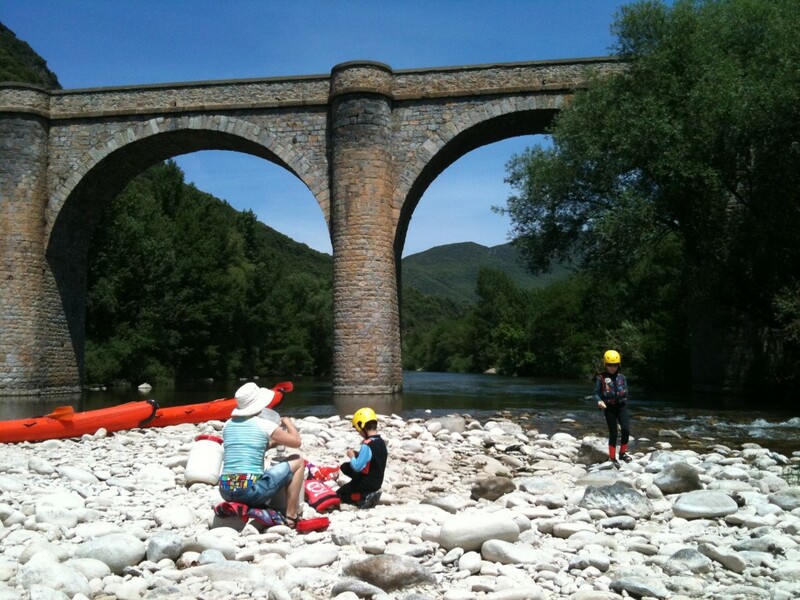 Upon arriving in Roquebrun we soon had everyone kitted out and looking very professional. 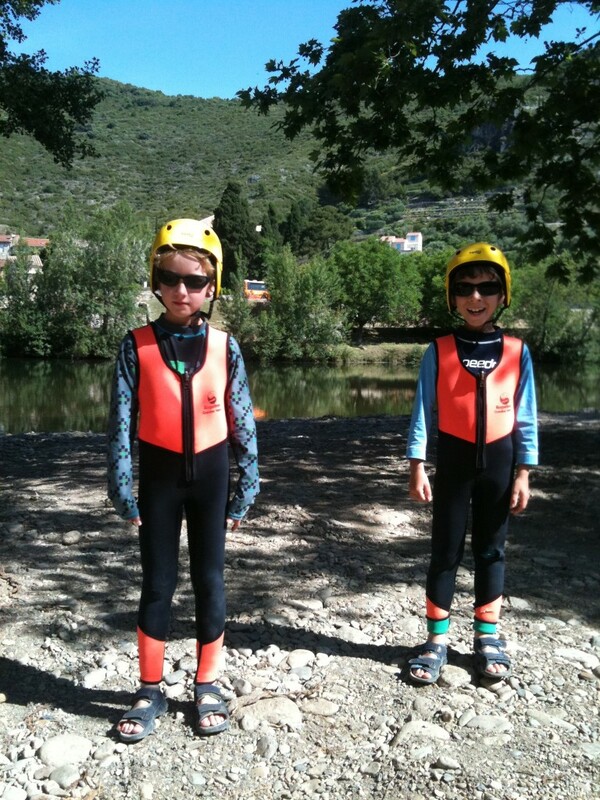 Well, the boys ended up looking a little like miniature aliens in their wetsuits, life-jackets and helmets. The canoe hire people then drove us about ten kilometres up-river to our put-in point and suddenly we were on our own in the middle of nowhere. The Orb river meanders quite slowly down through a deep, but wide, gorge. There are trees up most of both sides of the gorge and every now and again we came across a couple of houses either hanging on the cliff side or in one case built right into the banks of the river. The houses are all dry-stone and blend in perfectly with their surrounds. 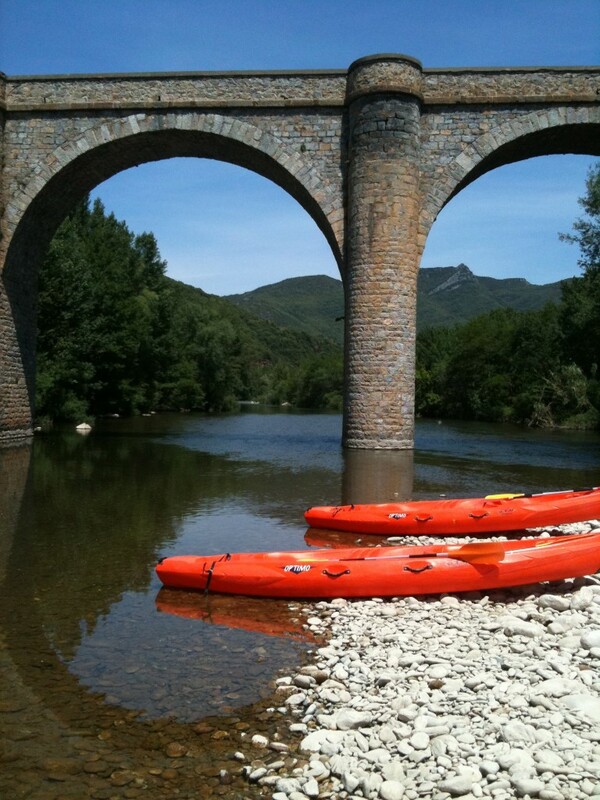 We went under a few lovely, arching bridges – tall and thin and, again, built of the local stone. 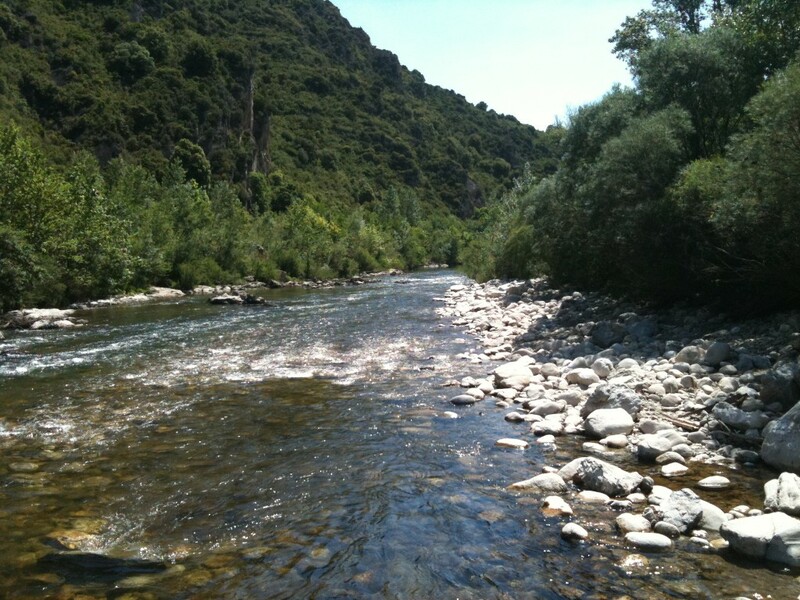 The thing we’ve always loved about rivers is the quiet stretches interspaced with the excitement of the rapids. 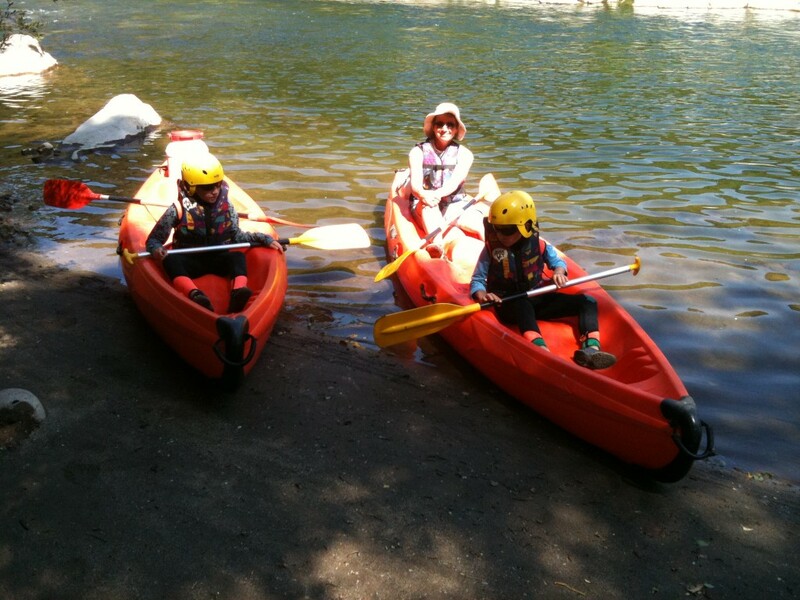 None of the rapids was particularly stressful although Jennifer and Declan came out on one which was scary solely because Declan panicked slightly (it probably didn’t help that we’d spent some time on the drive up telling them of our adventures kayaking in NSW in times past). Callum and I managed to get ourselves stranded against rocks on two separate occasions and disturbed clouds, absolute clouds, of flies while extricating ourselves. There were birds all over the place and we saw some fish. But by far the most spectacular wildlife was the insects. Every now and again on the quieter stretches we’d see a mat of greenery with small daisy-like flowers growing on it. Dancing amongst the daisies were dragonflies with wings so deep purple they almost appeared black. They flitted about so much we thought they were butterflies at first. Sometimes they’d be joined by smaller iridescent green dragonflies which moved in a much more typically stately fashion. We had a picnic lunch on a spit of white rocks just after one of the bridges. We were all a bit wet by then but the sun was pouring down so it didn’t feel cold. After lunch it took us about another hour-and-a-half to make it back Roquebrun. By the end Jennifer and I were feeling our arms and I know that tomorrow we’re going to wake up certain that we did some exercise. 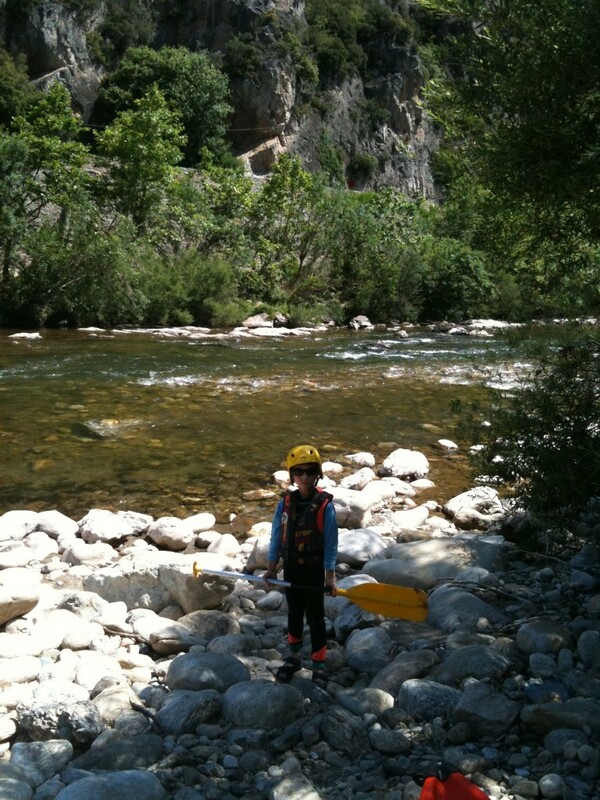 Callum did a good job of paddling and was getting a real feel for navigating the rapids. Declan, smilingly, spent the trip as he put it ‘lazing about in the sun’. We all agreed that it was one of the best days we’ve had this trip. And we even have dinner with the Taylors to look forward to tonight. I may even be able to force enough energy into my arms to raise a beer to salute a great day.